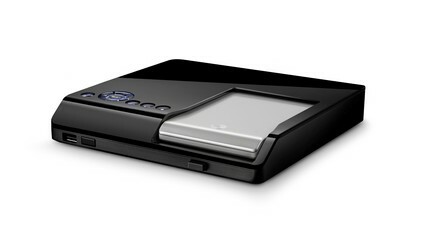 Shiny Preview: Seagate Freeagent Theater HD Media Player. Last night we managed to get a sneak preview of the latest release from Seagate, their brand spanking new Freeagent Theater Media Player. It looks very stylish, with a black gloss finish, and is designed to be a dock for your Seagate hard drive (or any USB compatible device) that plugs straight into your TV. Though they call it a HD player, it surpisingly has no HDMI port.. but it does have a nifty 8x zoom feature you can use on images AND movies. See a bigger pic after the jump. Due to low lighting at the event, we thought you might want a better image of the device. It’s attractively priced for the market, but you do have to wonder whether this is just a preview, before the HD Media Player 2 gets released, with all the issues rectified. Around £89 from Seagate in the beginning of April.